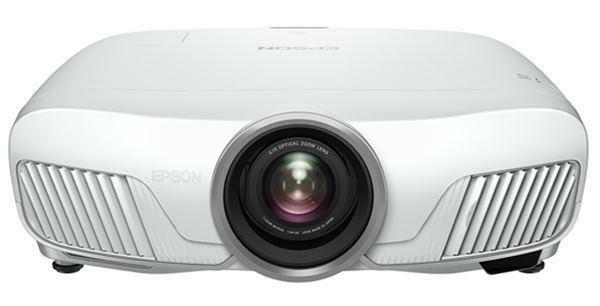 The Optoma UHD60, now priced at $1799, is unique among the 4K projectors under $2000 in several ways: It has the highest lumen rating (3000), the highest contrast rating (1,000,000:1), and the lowest audible noise rating (28dB). And from what we've seen so far it can be the brightest in certain situations, it could be the highest contrast, and it is definitely the quietest of the units in this wave of recently released, aggressively priced 4K projectors. 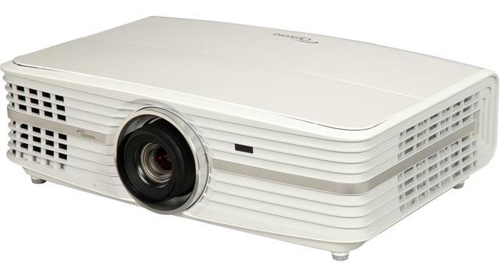 The Optoma UHD60 uses the 0.66" DLP chipset, whereas most of the 4K projectors under $2,000 use the new 0.47" chipset, including the ViewSonic PX727-4K ($1299), the Optoma UHD50 ($1499), and the BenQ HT2550 ($1499). Though there is no visible difference in image detail or resolution between the 0.66" chip and the 0.47" chip, the larger chip enables engineers to design for higher light output if they wish. It also gives the designer some additional flexibility to achieve higher contrast as they work with trade-offs between lumen output and contrast. Brightness. The Optoma UHD60 is rated at 3000 lumens. However, its Bright mode, which puts out close to 3000 lumens on our test sample, is overtly green in tint and for the most part useless for video presentation unless you don't mind a greenish picture. The remaining preset modes are not as bright but they give you much better color fidelity. The UHD60 has a Brilliant Color feature which can be set from 1 to 10. The default setting is 10 in all modes except Reference, where it is set to 1 (off). Color saturation and contrast is affected by these settings. In Reference mode, color brightness is 100% of white. On the other hand, in the modes where Brilliant Color defaults to its maximum of 10, color brightness is 55% of white, thus yielding a lower color saturation and brightness relative to white highlights. This can make white elements in a scene appear brighter than surrounding colored elements. As you drop the Brilliant Color setting, color brightness is maintained while white is reduced. So for example, reducing it from 10 to 6 reduces overall ANSI lumen output by about 17%, but color is not diminished. Color brightness now measures about 70% of white instead of 55%. With this shift there is an increased color saturation and contrast that improves the overall picture, particularly if you are viewing in a dark theater room. Subjectively many users will find the maximum Brilliant Color setting to be the most appealing because (a) it is the brightest, and (b) it still has sufficiently vibrant color content to avoid looking weak or diminished in saturation. This is particularly true where there is some ambient light in the room or you are setting up a particularly large or low gain screen. However, in a dark theater you may want to experiment with pulling Brilliant Color down to somewhere in the 5 to 7 range to get the increase in saturation and contrast. The results you get will depend upon screen size and gain, and the type of screen. Which setting ultimately appeals to you the most is a matter of personal preference so there is no "ideal" setting. But keep in mind that all of the ANSI lumen measurements in the table below are taken with Brilliant Color set to its default of 10, with the exception of Reference mode where it is off. The Optoma UHD60 has a single Eco mode which reduces light output by 37%. Eco mode becomes an option when Dynamic Black is turned off. On our test unit there was an intermittent flicker in Eco mode, indicating the light source or power supply did not like being run at that level. The picture is stable in both the Bright and Dynamic Black modes, which are the two modes you are likely to prefer anyway. Zoom lens light loss. The UHD60 has a 1.6x zoom lens that loses 26% of the projector's maximum light potential when set to the telephoto end, which is not atypical for a zoom lens of this length. So if you want to maximize light output, try to install this projector close enough to the screen that you are using the wider angle end of the zoom range. Picture Quality in SDR. Out of the box, with the UHD60 in Cinema mode shows a picture that is bright, reasonably high in contrast, and with remarkably good color balance compared to competing models we've seen. Black levels are sufficient to give a pleasing depth, but they are not as deep as you will get on higher priced home theater projectors. They are however competitive with other options in this price range. A few tweaks will help to improve picture quality. As noted above, you should experiment with the Brilliant Color setting to see whether the default of 10 is best for your installation and screen. Similarly, color saturation at the default of 18 may be too rich and worth pulling down a few notches. There is an Ultra Resolution control which defaults to 1 on a scale of 0 to 3, and should be turned off to minimize noise. Sharpness can be bumped up a couple notches without introducing noticeable artifacts. But these are personal preference adjustments and the picture is quite engaging even without these alterations. HDR performance. The great thing about HDR on projectors in general is that it does NOT look like the harsh, digitally overprocessed look of HDR on flat panel TVs. HDR, the latest gimmick designed to render the TV you just bought two years ago obsolete, is certainly flashy, and it dazzles consumers on the floor at BestBuy and Costco. But it does not wear well, especially on a big 120" screen. Why? In most cases it looks distractingly artificial. Thankfully, the quality of reflected light you get from a projector+screen in a home theater (like that of a commercial movie theater), has a refinement and elegance that you don't get from the glare of a TV. The quality of this light tends to mitigate the artificial character of HDR, as does the fact that the projector does not boost or darken local areas of the video image like a TV does. The UHD60's HDR picture is truly impressive straight out of the box; it is remarkably well color balanced, very high in contrast, and (more vitally) completely natural looking. The best of the HDR implementations in front projectors improve the overall contrast and dynamic range of the image beyond what it would be in SDR without making it look digitally manipulated, and this is what we see on the UHD60. The last thing you want to be thinking while watching a film is "wow, look at that HDR." Anytime the video technology itself distracts you from your immersion in the film it has failed. With the UHD60, Optoma has achieved a refined and sophisticated natural balance with HDR. As noted elsewhere on this site, projectors typically benefit from contrast, brightness, and saturation adjustments to accommodate each individual HDR disc or source. If saturation looks overdriven on a particular disc, take a moment to pull down the saturation control, etc. This is not the fault of the projector, but the non-standardized output levels of the sources. And once you've got the picture dialed in, you get a riveting, deeply engaging video experience, so it is worth the effort to make a few tweaks when each new HDR source seems to call for it. Image Sharpness. On the UHD60 the lens is very sharp in the middle two-thirds of the image, and tends to soften somewhat toward the sides and corners. However, the subjective viewing experience is one of a very sharp picture across the entire screen since the eye rarely focuses on the sides or the corners of a big screen image; even when it does the softness is subtle enough that it does not look blurred in typical video material. The focus issue is mostly detectable when viewing a test pattern, a still graphic, or a financial spreadsheet. Input Lag: The UHD60 has an input lag of 63 ms with Dynamic Black on and 56 ms with Dynamic Black off. Fan noise. The UHD60 has an audible noise rating of 28 dB, which is the lowest of any of the 4K projectors under $2000. This spec reflects a real difference in fan noise between the UHD60 and its competition. Bottom line, if you're particularly sensitive to fan noise you will love the UHD60. Rainbow artifacts. The UHD60 has an RGBCY wheel. One may see rainbows on occasion with this configuration. When viewing typical film/video, for me they are scarce and don't rise to the level of a distraction. Some people never see rainbow artifacts, some see them on occasion and are not bothered by them, some find them distracting. If you don't know your own sensitivity to rainbows, buy the UHD60 from a dealer with a friendly return policy and test it out for yourself. On board Audio. The UHD60 has two 4W speakers. The audio is rather loud and has good bass range for an onboard system, generally about as good as we've heard from a projector. This is handy for portable use or backyard movie night. For serious home theater, if you don't want to go for the full surround system, then consider an external sound bar. This projector demands bigger audio than anything the projector itself could generate. Lamp Life. At the moment, Optoma is representing that the UHD60 will get 4000 hours in full power mode, 10,000 hours in eco, and 15,000 hours in Dynamic Black mode. Replacement lamps. A new lamp for the UHD60 is currently priced at $199. Warranty. The Optoma UHD60 comes standard with a 2 year warranty. The Optoma UHD60's handy 1.6x zoom lens will accommodate a throw distance of anywhere between 12 and a bit over 19 feet to hit a 120" diagonal screen. If your screen is bigger or smaller, check the Optoma UHD60 Projection Calculator for your distance ranges. This means that if your seats are at a distance of 1.2x or 1.3x the screen width, which would be about 10 to 12 feet from a 120" screen, the projector will be located at or behind the seats. Since the fan noise is so low, you don't need to worry about isolating the unit, and using the wider angle end of the zoom will maximize light output. Ceiling mounting over or just behind the seats makes sense. The UHD60 has a built in throw angle and modest lens shift. At the minimum position of the lens shift the centerline of the lens intersects the bottom edge of the projected image. From that position you can use the lens shift to raise the image about 20% of the image height (or lower it about 20% if ceiling mounted). Basically, the lens shift is an ideal feature for accommodating a ceiling mount installation. Since the fan noise is so low and the exhaust flow and heat dissipation is not problematic, you could also consider placing the projector on a low table between the seats, making sure to give it at least 6" clearance on both sides. Keep in mind that the bottom edge of the projected image will be at the level of the lens, and if you're going for a 120" screen you won't want it too high up on the wall. On the other hand, placing the UHD60 on a rear shelf so that it projects over the heads of the audience is a bit more of a problem. In most home theater situations it will throw the image too high on the wall. You would need to tilt the projector downward, and there is no keystone adjustment available on this unit to square up the resulting distortion. Ultra Resolution. The Ultra Resolution feature is intended to add detail and sharpness but it also accentuates noise to the point where it is problematic, especially in HDR. We found the best overall picture quality was acheived with this particular feature turned off. As it is, it always defaults to 1, which is a low setting but still not advantageous in our view. Eco mode flicker. The image luminance is unstable in eco-mode. Avoid the use of eco-mode, and opt for either Bright or Dynamic Black (which in theory gives you 15,000 hours of lamp life). The good news is that since fan noise is very low even in Bright mode, and you can reduce lumen output if necessary by reducing the Brilliant Color setting, there is no reason to use eco mode at all. No 3D. None of the inexpensive 4K projectors have 3D in 4K resolution, and most do not have 3D even for 1080p. This is one of them. If you want 3D look elsewhere. No Keystone Adjustment. Make sure to carefully place your projector relative to the screen such that the centerline of the lens is perpendicular to the screen plane. Any tilt to hit a screen that results in a trapezoidal image cannot be corrected with keystone adjustment. Rainbow Artifacts. Though rainbows are relatively low in frequency on this projector, they are not non-existent. Those who are sensitive to this artifact may find them distracting. Keep in mind that rainbow frequency is directly related to the eye-movement of the viewer. Sitting very close to a screen will maximize eye movement and thus the tendency to see rainbows, while sitting back a ways will minimize it. Size and build quality. The UHD60 is larger than most of the 4K projectors under $2,000. The good news is that the larger form factor contributes to the very quiet fan noise--smaller projectors tend to be louder since there is less room to baffle the noise. The UHD60 has thinner, flimsier casework than competing units. The lens shift knob is cheap -- enough to get by, but it does not exude quality workmanship. So it is obvious that Optoma cut costs in the overall build quality. On the other hand, most of the other 4K projectors under $2,000 don't have any lens shift at all. The casework does not affect picture quality, so once installed it is of little consequence. The Optoma UHD60 offers some very key advantages including high contrast, solid black level, good color calibration out of the box that can easily be tweaked to outstanding, strong HDR performance, and very low fan noise. Flesh tones in particular look warm, healthy and natural, lacking the cool bluish tint that some of the competing units manifest out of the box. In short, it is a fun projector to watch and easy to enjoy. Beyond this, its 1.6x zoom lens and lens shift make this projector more flexible than most of the 4K competition as far as choosing installation options and actually accomplishing the installation. The lack of precise focus in the corners and along the sides of the image is obviously undesirable but it is hard to say, practically speaking, how much of a problem this is. You can see it on a grid test pattern. But you don't notice it when watching a movie since the sides and corners of the picture are rarely where the eye is looking, and full motion video is inherently less precise than a graphic test pattern anyway. So the subjective viewing experience of the picture as a whole, once you are immersed in the drama of a film, is that of a rich, solid contrast picture with high detail resolution that looks unquestionably sharp. Where film/video subject matter is concerned, contrast, color balance and color saturation become the more consequential factors in overall perceived picture quality than the focus issue we see on this unit. Most people could watch a demo of the UHD60 and never be aware of it unless they had read this review. In the end, all of these new 4K projectors in the sub-$2000 price range represent value trade-offs. None of them (so far) are perfect -- each of them has problematic flaws and missing features. This is no surprise given the rush the industry is experiencing to establish market share in the 4K space. But these are all exciting products that each have advantages over their competitors, and they all tend to be outstanding values in the sense that 4K resolution has plummeted so rapidly in price. When it comes to the Optoma UHD60, its strengths are contrast, color balance, solid natural HDR, zoom range, lens shift, and exceptionally quiet fan noise. In each of these aspects it surpasses the 4K competition and thus offers a unique value proposition. It is much easier to get an engaging and pleasing picture from the UHD60 than from some of the competing models. If buyers were able to see all of the sub-$2000 4K projectors lined up side by side, we suspect that the UHD60 would be chosen a good share of the time on the strength of its overall subjective picture quality. Eco cinema mode 800 lumens... lol. Wow. 650 in HDR mode and eco... Seriously not impressed. The projector is putting out 3000 lumens. At this rate I'd have to get something around 5000 lumens to get 2000 on screen. I'm rainbow sensitive and I can confirm that it is not occasional but rather constant. I would estimate that I can't go 10 seconds without seeing one on this projector. Dark scenes are exceptionally bad. My comment for the Optoma UHD60. Regardless what the numbers says, this projector is diplaying 150" on my screen with extreme brightness,very sharp images and amazing colors. Eco mode + dynamic black giving the light source life a 15000 Hrs. The contrast is one of the best i have seen so far comparing to other projectors. In regard to Rainbow effect Honestly,you could hardly notice it. For the price it is the best in the market.